The relationship between Islay and Malt Whisky is as old as the history of the spirit itself; Islay is thought to be one of the first beneficiaries of the old Monks’ distillation knowledge when they came from Ireland to Scotland. As harmonious as the relationship between Island and spirit is, their combined history has been a difficult one often fought between smuggler and authority. Many tales exist about the activities of both illicit distiller and exciseman, celebrating the futile attempts of both parties to better the other. The 1823 Excise Act and the subsequent reforms made legal distillation viable for many illicit distillers who subsequently appeared as respectable and legitimate distillers. 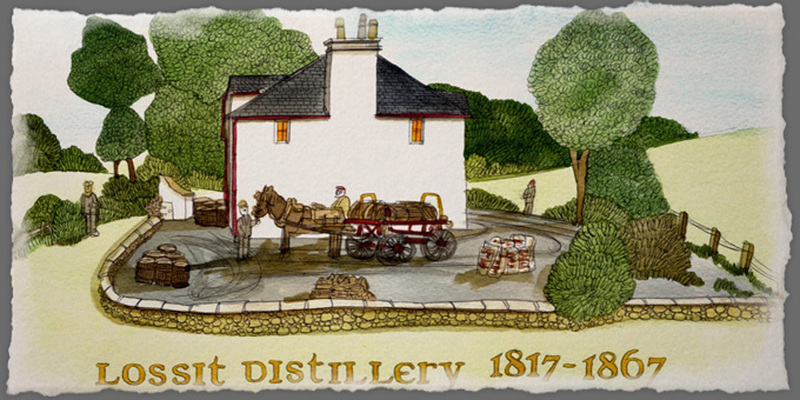 Lossit Distillery 1817-1867 – an artists’ impression. By Adrian B McMurchie. Except for the owners of the largest distilleries, whisky represented an additional source of income rather than a sole profession. Rural communities such as Islay therefore saw the striking emergence of a class of farmer-distiller, men who could turn their perishable malt into profitable spirit. These men came to symbolise and progress the taste and style of small-batch Malt Whisky for generations to come. Malcolm McNeill, founder of Lossit Distillery, was one of the leading farmer-distillers of his age. Founded in 1817, Lossit was the biggest producer of whisky on Islay in the industry’s formative years and lasted for half a century until it was silenced in 1867. The longest surviving and most successful of Islay’s farm-distilleries, Lossit was part of the transformation of Islay’s reputation from an outpost of smugglers to a leading force in the whisky industry. Lossit Distillery was situated in the Parish of Killarow & Kilmeny towards the East of Islay near to the small settlement of Ballygrant; the A846 arterial road from Port Askaig to Ardbeg cuts through the village before turning south at Bridgend. The site is known as Lossit Kennels, but is now a private residential property on the DunLossit Estate. Caol Ila is the closest existing distillery to Lossit, while the industrial might of the nearby Bunnahabhainn was envisaged long after the small stills of Lossit had cooled. Tucked away in a dip between Loch Ballygrant and Loch Lossit, the distillery’s water supply, surrounded by both woodland and moors, Lossit holds a unique position in the rugged Heartlands of Islay. Lossit’s ability (and need to) utilise entirely local supplies to build a business that could satisfy both local and national markets is a structure that many Single Estate distillers are attempting to replicate today. It could even be said that Lossit was the original Single Estate distillery! Lossit featured all the amenities that made Islay distilling so desirable for illicit distillers: water, peat, space, and seclusion. As an illicit farm- distillery, Lossit relied on grain from its own supply of barley and fuel from the nearby peat bogs. Lossit would have changed little once licensed; most of the distilleries that emerged in the 1820s would have already existed prior to the 1823 Excise Act. As a farm-distillery, Lossit was able to utilise its own available resources and ingredients for the spirit, using a work force that combined its duties as both distillery workers and farm hands. Farm distillation required several working seasons, so labourers needed to be flexible. Output was affected by the realities of rural life, particularly in the warmer summer months. It was hard to get peat and barley ready, regular droughts reduced water supplies and labour was in short supply due to the workers’ other farming responsibilities. Peat cutting, haymaking and preparing for the harvest were labour intensive, time-consuming jobs that left little time for distillery work. “In Islay, the distillers are all farmers!” – Thomas Dunbreck, Excise Collector. Nevertheless, distillation was a normal part of farm life in the Highland region. Licensed distillers before the 1823 Excise Act had to fight the illicit trade and bad road conditions, while the crippling poverty of their ultimate customers limited the prices that could be charged. Couple this with the inconsistent and constantly changing taxation of the British Government with the fact their market was limited to the Highland region and it is little wonder that few were tempted to cross over into legitimate distilling. Lossit first became known as an active distillery in 1817 during a period of great change on Islay. 1817 also saw the last of several early 19th Century food crises on the island that convinced the new Laird of Islay, Walter Frederick Campbell, to create non-agricultural means of employment. The Small Stills Act of 1816 persuaded many to begin small-scale whisky production, although not necessarily legally. Whisky, along with fishing and weaving, offered a potential solution to the employment problem. Walter Frederick Campbell’s new settlements at Port Ellen, Port Charlotte, Port Weymss and Keills opened up the possibility of new industry on the island. Efforts to convince the Ileach to change their drinking habits had resulted in the foundation of a brewery by a previous Laird, but the taste for local malted spirit was too ingrained. Few islanders moved to other drinks from illicitly distilled whisky – it was the drink of choice for most. Frederick Campbell moved to persuade illicit distillers and landed gentry to establish or legalise distilleries on Islay. Twelve, including Lossit, were officially ‘founded’ in this period. Of these, Lossit, Daill, Newton, Tallant and Mulindry were all farm distilleries of illicit origin. Lossit, missing from the 1821 survey of licensed distilleries, emerged in the 1826 records, post-Excise Act, as the largest producer of whisky on Islay. For Malcolm McNeill, the transformation from illicit whisky producer to respected distillery owner made little difference to his social standing. Born in 1785, McNeill was from a large clan with interests on Islay, Campbeltown, Jura and further afield. By the time Lossit emerged in 1817, McNeill was an established and respected Tacksman on Islay. A Tacksman (from Gaelic Fear-Taic) was a landholder of intermediate social and legal standing in Highland society who paid a yearly ‘Tack’ to the majority landowner (the Laird of Islay in McNeill’s case), before then sub-letting the land to others and keeping some for himself. As a Tacksman, McNeill held enough land to vote in Parliamentary elections during the period, while he was also a prominent member of the agricultural community. A champion breeder, he was a Committee Member of the Highland and Agricultural Society of Scotland. McNeill’s achievements as a distiller stemmed from his successes as a farmer. A successful harvest meant excess barley available for distillation, while the end of the Napoleonic Wars had eased Britain’sgrain crisis, meaning it could be used in products other than food. 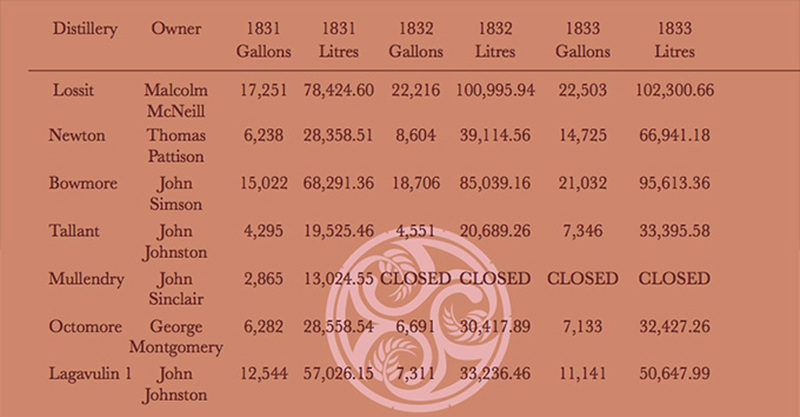 Lossit’s production figures of 12,411 imperial gallons (56,421 litres) between 1823-26 at an average of 4,137 imperial gallons (18,807 litres) per year, the biggest on Islay, were achievable because of Lossit’s status as a high quality farm. This was all the more remarkable considering Lossit’s illicit past, and the inherent weaknesses of the smuggling trade which many carried on into pot-still legalised distilleries: a low yield of spirit, waste of spent grains and uneven quality of spirit were all hangovers of the illicit industry. Despite these potential issues, McNeill managed to maintain the fragrant, characteristically peaty taste of Lossit that so many cherished. As a leader of the Islay distillation boom that saw the number of legal distilleries double from six to twelve between 1824-30, Lossit was well placed to capitalise on the new opportunities offered by legal trade. Between 1823 and 1836 legal whisky consumption increased by 287%, mostly due to illicit suppliers moving into legal channels and their customers following. Supplies of Lossit were sent to the ‘Islay Cellar’ in Glasgow, a shop managed by Mr Crawford Graham, which sold Islay whisky to a west coast public eager for a taste of the island. Surviving receipts show that casks of Lossit were sent to Ireland, a simple journey considering the close proximity between Islay and the Emerald Isle. Lossit continued to thrive into the 1830s. Malcolm McNeill sold his twice-distilled deep still whisky in numbered casks of ‘Best Aqua’ to a variety of customers. In 1833 McNeill was forced to apologise for a shortage of casks due to high demand and tasked a client with finding more. We can only assume he was successful! 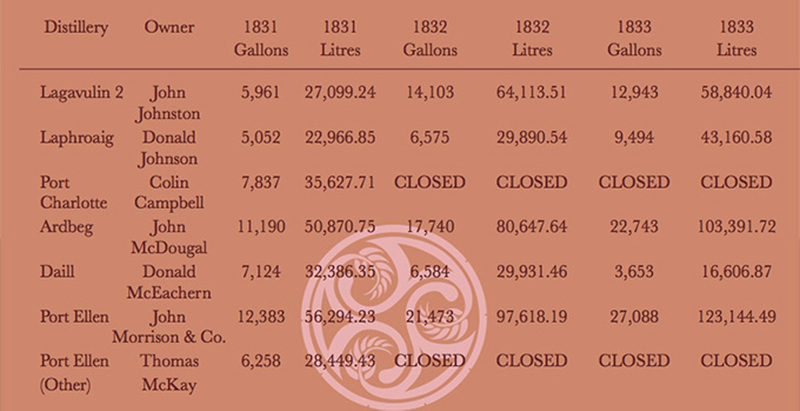 That same year, Lossit recorded production figures of 22,503 imperial gallons (102,299 litres), an increase of 444% on the estimated output of 4,137 imperial gallons (18,807 litres) in 1823. Production at Lossit amounted to 13.25% of the 169,718-gallon (765,000 litres) total output by Islay’s twelve legal distilleries in 1833. Lossit’s figures in 1833 were still among the highest on Islay; only Ardbeg and the new Port Ellen, converted from a malt mill, were able to produce more. Distilling was the only industry in the parish of Killarow and Kilmeny, but the wider economic climate, meant that producing whisky on any scale was a very challenging task. To be Let, with entry at Martinmas, 1850, and for such period as may be agreed on. The well-known distillery of Lossit, with the land immediately adjoining, situate in the Parish of Kilmeny, within a short distance of the public road betwixt Port Askaig and Bridgend, and about three miles from the former. The incoming tenant will obtain right to the utensils, &c., according to valuation, and he will be accommodated with such additional land as may be desired. The character of this distillery has been so long and so favourably established, that it requires no description. Apply for particulars to Messrs. Browns & Pearson, 128 George Street, Edinburgh; or to Mr. Webster, Daill, Islay, with either of whom offers may be lodged. The next few years saw a period of expansion in both the staff and buildings. A waterwheel was built to harness the artificially widened stream from Loch Lossit, while the distillery took on the courtyard-style that was to remain a popular distillery design for over half a century longer. A cooper was advertised for Lossit in 1850 and again in 1856, as was a distillery worker with experience in the mash and still house. The Stewarts cultivated their ties to the mercantile city of Glasgow and used an office on Howard Street as a distribution base. Tied to this was the distillery’s spirit cellar, sold in 1856, which stored and distributed Lossit whisky in the centre of Glasgow. Lossit was not dead, but this was to be the end of its era as a farm distillery. The distillery was purchased by the Stewart brothers, George and John Chiene, young men from Haddington, East Lothian, an agriculturally abundant area with a strong whisky heritage. Aged 24 and 20 respectively in the 1851 census, the Stewarts took on Lossit solely as a distillery and removed the farm element. The census labels George as the distiller and John Chiene as distillery manager; they are accompanied by a skeleton staff of three distillery labourers, all from Glasgow. Lossit was built on land predominantly consisting of slates and phyllites, overlain by glacial, post- glacial, fluvoglacial and fluvial materials. Water for the distillery flowed from Loch Lossit through a series of sluice gates, over a slate-lined stream via Lossit, before it meandered through woodland and spilled out into Loch Ballygrant. The stream was probably widened when the waterwheel was installed to precipitate a greater flow. However, the violent seasonal fluctuations on Islay meant that even with these safeguards Lossit would have struggled to attain enough water during the summer months to continue production. There is no evidence of a pool, as in later distillery designs, so Lossit was reliant on Loch Lossit retaining consistent water levels. Loch Lossit, its contents yellowed by peat, is slightly south of Lossit on raised ground. A glacial lake, the water of Loch Lossit is smooth despite its high peat content, and is further filtered by the slate it must pass over to get to the distillery. This filtration through slate is characteristic of Islay water, while the peat-bedded Loch Lossit heavily affected the smoky nature of the Lossit whisky. Lossit would have had a natural acidity due to the water’s filtration through peat at source, but gained smoother, softer elements due to the slate. A consistent supply of water was desperately important for a rural distillery like Lossit. It was needed to steep the barley, mash, mix the wash, cool the distillate, clean vessels and water down the final spirit, let alone power the distillery and imbue the spirit with much of its character. and the increased consumption of potatoes that unrestricted use of barley for whisky distillation was accepted. Lossit, like most distilleries, used local supplies, either from its own crops or nearby lots. Harvests were often inconsistent, so sufficient storage of malt was vital to ensure there was enough for next year’s production. Once steeped for several days in barrels, the Barley needed to be spread on a malting floor. Home-grown barley contains 20% moisture; to germinate properly, moisture content had to be reduced to around 10% moisture. Malting floors were hot, dry environments that required as little natural light as possible. Lossit’s malting floor was on the top floor of the distillery buildings, and was lined with small, low windows to allow light in but not disrupt the germination process. Directly next to the malting floor was a peat-fired kiln with a perforated floor where the malt would be dried and smoked by the fragrant peat burning below. Scorch marks burned into the underside of the roof testify to the building’s former occupancy. Islay is fortunate to possess a huge amount of natural fuel in the peatlands, and Lossit would have been able to cut from the peat bogs in their woodland or further afield on the fens. Lossit’s smoky whisky would be characterised by floral, hay like flavours through the decomposed trees, mulch, bracken and leaves that make up the woodland peat. The woodland is beautiful, atmospheric and sturdy, the peat thousands of years in the making. Lossit peat, flavourful as it is, would like the water of Loch Lossit be used in most stages of the whisky-making process. As well as dry the barley, it would also warm the washback, fire the stills and heat the poor workers on a freezing Islay night. As Frederick Maclagon of Haig’s of Lochrin noted, it was fortunate the taste of peat proved so popular, for the constant use of peat as a fuel meant it was impossible for the whisky to taste of anything else! Following the courtyard-style of distillery, Lossit’s mash-tun, a wooden puncheon turned by hand would have been situated on the ground floor. Lossit used an all-malt mash; not only did this result in a drawback of 1s 5d per gallon produced, but it was reputed to produce a pleasant tasting, fragrant spirit. Turning the mash using wooden paddles was laborious, tough work. Highland distillers favoured a weak mash, as it was thought to release more flavours when eventually distilled. The completed mash would be transferred to the wooden washbacks, where Lossit’s yeast culture was added to begin the fermentation process. Lossit would eventually use its own culture, cultivated from brewer’s yeast, to ensure a consistent taste. Although knowledge of yeast was still raw in the early Victorian period, the general principle was understood remarkably well. As an illicit distillery, Lossit likely used wild yeast, collected from the moorlands. Lossit’s wash was distilled ’using common legal stills, producing spirits at two distillations. Lossit used two old pot-stills – a wash still and a spirit still. These were small, stumpy and deep stills of illicit style, capable of producing approximately 4,100 gallons per year in the early 1820s. The small head of the still meant a possibility of the distillate boiling over and running foul, so low temperatures were favoured. This was easier said than done when using a peat fire! The final Lossit spirit produced would be an expression of its locality, with smoky, coastal hints, smooth and buttery to the palette, and featuring the famously vibrant illicit flavour. • Half of an old small cauldron. Distillers and buyers were already aware of the effect of aging and maturation on the whisky, but the nature of the local market meant that each individual could carry away a cask of Lossit with slightly different characteristics. Customers supplied their own Sherry, Brandy and Madeira casks to be filled at the distillery, resulting in varied flavours. Lossit, however, also sold whisky in its own supply of casks by the gallon. In 1833 a cask from Lossit cost 5 shillings, 6 pence to rent McNeill requested the return of casks within a month so he could re- fill them for further usage, resulting in a flowering of different flavour influences on the stored whisky. Mr Cunningham, a long-term buyer, had not returned any casks for three years, much to the disgust of Malcolm McNeill. Lossit’s casks were likely originally used to store Sherry, a spirit already popular in Scotland, or were pure oak made locally for the distillery’s use. Spirit would be sold at a variety of prices depending on age, but a maturation period of five to eight years was considered to produce the ‘Best Aqua.’ Receipts were labelled ‘Bought of Lossit Distillery, Islay,’ and noted the individual cask purchased, much like an independent bottler would use to sell a Single Cask whisky today. These sherry casks, full of Lossit whisky, would imbue sweet, zesty fruit flavours upon the spirit as it aged. The all-encompassing woodland peat would add coastal smoke and fragrant notes when drying the malt, with floral notes added by the bere barley. Soft, slate-filtered water from Loch Lossit would result in a smooth, lingering taste. Deep, small stills produced pleasant, flavourful spirit, instigated by the characterful use of an all-malt mash. Vibrant illicit flavours were matched with successful production methods and local ingredients to produce a popular, highly regarded whisky. Despite the ‘superior quality’ of the ‘celebrated’ Lossit, the 1850s were an unforgiving time to be a pure malt distiller. The rise of the big blending firms had changed the palate of drinkers, particularly in the industrial mainland, and those malt distillers who survived were required for the burgeoning blended whisky market. For the Stewarts, the limitation of Lossit’s lack of transport links was clear, and they sought a return to the mainland in the early 1860s. Although George was to retire from the whisky industry to become a corn clerk, John Chiene was to prove influential in the future of whisky. After a spell as a manufacturing chemist in Glasgow, John Chiene emerged in Edinburgh as the owner (John Stewarts & Co) of the famous grain distillery at Kirkliston; it was he who instigated many of the conversations that resulted in the amalgamation of six lowland grain distilleries into the famous Distiller’s Company Limited. When the Stewarts left Islay in 1862, they might have been forgiven for believing they had saved the distillery. Lossit was taken over by Bulloch, Lade & Co, a blending firm founded in Glasgow that also owned Camlachie and was soon to build Benmore in Campbeltown. Founded in 1856 after the joining of Bulloch & Co with D. Lade & Co, the company specialised in dealing whisky as blenders and commission agents, and were therefore able to utilise a distribution stream the Stewarts could only dream of. Rather than as a pure malt, Lossit was used in the Bulloch, Lade & Co blend as the respected Islay punch that can turn a blend from ordinary to outstanding. It is possible that production was intended to restart at Lossit after its purchase, were it not for the emergence of the relatively new Caol Ila onto the market in 1863. The opportunity to acquire a modern distillery with far superior transport links was arguably too good to miss. Lossit was limited, small and secluded in comparison, the qualities that made it perfect for illegal distilling now a hindrance. For Lossit, its spirit would continue to be used in the BLC blend and to furnish local markets, but any production had ceased by 1867. After Bulloch, Lade & Co relinquished its lease in 1870 and vacated the property, the distillery was gutted and its plant buried in the property’s driveway. There the stills remain in their grave, the brand never to be tasted again.